There's a pony in here somewhere! Ouch – this was a tough one to photograph, but I couldn’t not bring it to you because it’s my first Royal Foodie Joust with The Leftover Queen and Ravishing Rice is the topic for the next monthly mingle at Edible Garden. Plus, plus it’s got Chicago Bacon in it! Need I say more? The black rice is something I usually use for a Thai black rice pudding, but for the challange thought I’d break things up a bit. I’m certain the dish would taste just as great with Jasmine Rice. AND it might photograph better too! Below is the recipe for the rice and click on Sun Dried Tomato Butter to get that recipe. 1 Cup Cubed Bacon – if you’ve got Chicago Bacon – then use it! the smoky flavor is very good here! Let simmer until soft – add more water if neccessary. This looks good too! Love your photos – you are really doing good with that! Nice entry…I’d like to try some! Oh, this is different. I’ve never seen a recipe like this with black rice. 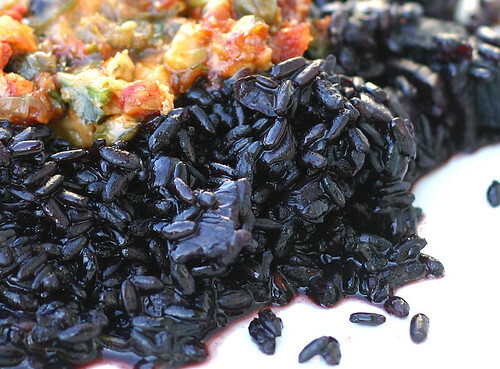 I have some Chinese black rice and Thai purple rice that I have been having trouble finding good recipes for. A lot involve coconut milk, which I find turns the dish too sweet. I made Chinese black rice with edamame, soy, ginger, onion and sesame oil, but I found it bland. But bacon…well, I shoulda thought of that! Brittany – everyone loves bacon sister! I would have never thought of it either, but it was the Royal Food Joust challange – so I had to make it interesting.